Did Jill Stein Help Elect Donald Trump? And Put a Science Denier in the White House? In the final week of 2018, Michael Bloomberg — the former mayor of New York, a Republican turned Democrat, and a possible future presidential candidate — went on television to issue a remarkable challenge to fellow politicians: He would insist that every candidate in 2020 lay out a comprehensive plan to combat climate change. This announcement was remarkable if only for the fact that not a single candidate in 2016 had seriously addressed the issue — not even Jill Stein, the candidate running on the Green Party ticket, the very name of which is derived from the issue at hand. This was hardly the only mystery about Jill Stein and her 2016 run. There are many unanswered questions. Why did she run for president in the first place? She had only received a third of one percent of the vote when she had run in 2012. Based on that dismal record, who stepped forward to fund her? And why did she seem so close to the Russians throughout the campaign, at times filming campaign spots in front of the Kremlin? And why were her comments — and those of Stein’s running mate — far more vicious about Hillary Clinton than they were about Donald Trump? Finally, as marginal a figure as she was throughout the campaign, could she have nonetheless affected the outcome? That question is pivotal because, if Stein in any way helped Trump into the White House — wittingly or unwittingly — that would mean that the Green Party helped turn the country over to a climate-denying administration as hostile to the environment as any in modern history. Stein entered the presidential contest of 2016 as an enigma, and after an entire presidential campaign, she remains one. A Harvard-trained internist, a singer, a guitarist, a community organizer, and a health-industry reformer, Stein is a restless, ambitious polymath still in search of solid ground on which to stand. She has been running for decades for any and every political office in sight — one attempt for a seat in the Massachusetts House, two tries for the governorship of Massachusetts, and now two runs for the White House. Over two decades, she has won only one race — a council seat in the town of Lexington, MA. In all her other political adventures, she did not just lose but fizzled. In her two races for governor of her home state she actually lost ground from one race to the other, going from 3.5 percent of the vote in 2002 to 1.4 percent in 2010. As a presidential candidate in 2016 she managed to grab only 1.1 percent of the vote as a second-time candidate, running against two extremely flawed main party candidates. If she intended to promote a specific cause or causes Stein was drowned out by the general cacophony of far bigger personalities with fatter bank accounts and clearer messages. There was the teeming horde of Republican primary contenders, many of them famous names with long political careers. There was the Bernie Sanders Road Show with his boisterous young supporters on the left. There was Clinton’s historic run as the first female nominee of a major political party. And there was the three-ring circus of the tabloid celebrity who spoke of himself in the third person and liked to be called “the Donald.” Stein was even overshadowed by another third-party candidate, an inarticulate, and at times befuddled, campaigner and former New Mexico governor named Gary Johnson, who ran on the Libertarian ticket. Still, it is tempting to ask whether, in the final analysis, Stein’s candidacy, marginal though it was, might have made a difference in the final result. Might, in fact, have helped put Trump in the White House. The 26 months since the election have shed little light on questions surrounding Stein’s presidential campaign. They have barely been asked, let alone answered. Again, why did she run? Once in the race, why did she not go all out on the pressing issue which gave the Green Party its name and its identity? Instead, her “Green New Deal” served to check off a box rather than as a driving force of her campaign. Stein laughed, but otherwise left the remark alone. Viewed in retrospect, Russia did seem to play an outsized role in Stein’s campaign, and quite possibly in the limited success she had. Russia’s state-owned television station, RT, became for Stein what Fox News was for Trump — a safe perch throughout the campaign cycle. The very subject of Stein’s RT appearances is a sensitive one for many journalists to address, let alone criticize. Like Stein herself, many reporters, writers, and commentators who could not get any space or attention in mainstream media were drawn in 2016 to the cameras, microphones, and uncritical hosts of RT. As Gertrude Stein might have said, air time is air time. But in light of recent revelations about how widespread the Russian disinformation campaign was, and the role RT played, it seems fair to ask whether Stein’s appearances on Russian state television were just garden-variety opportunism, naivete combined with obliviousness to the optics, or something far less excusable. Stein announced her exploratory committee to run for president in February 2015 on Redacted Tonight, a comic television program run by RT America. Months later came the infamous RT lunch attended by Michael Flynn and Stein in Moscow. Much has been made of the fact that Flynn sat next to Vladimir Putin at that lunch; far less has been made of the fact that Stein sat at the right hand of Dmitry Peskov, Putin’s powerful press secretary, arguably the figurative head of RT, and the man with whom Trump’s operatives were discussing a Trump Tower in Moscow. 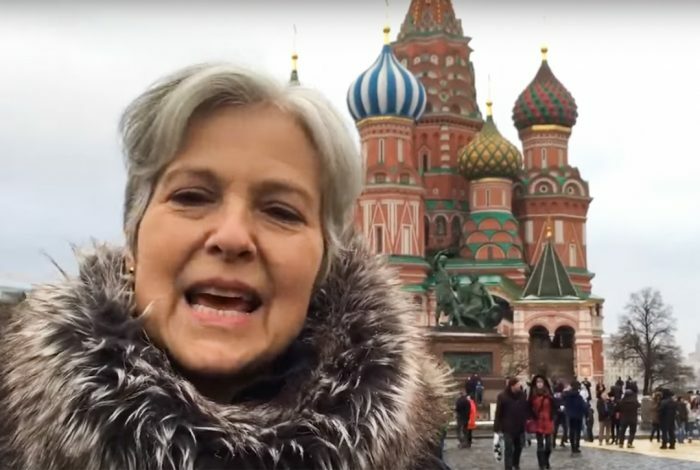 Stein has insisted that her campaign paid for the trip, but that merely raises a different question — why waste precious political donations in order to have lunch in Moscow? That is a position that politicians of various stripes could make on any given day, but as it was delivered in Moscow, outside the Kremlin, by a politician who had recently supped with Dmitry Peskov and Putin, the words take on more freight — she was delivering a script that Putin and Peskov could have written themselves. And that was not Stein’s only message on Russia. Like Trump, she all but mirrored Russia’s own position on Ukraine, castigating the Obama administration for installing a government in Kiev that was “hostile to Russia.” So much for notions of democracy or independent rule among the former Soviet Union states. That sounds more like a cold shoulder than a warm embrace. And pray tell, how do these four pillars of the party line up with Russia’s political prisoners, its history of poisoned political opponents, its fossil-fueled oligarchy, or its recent foreign land grabs? Not to mention its strenuous attempts to disrupt democratic elections. Giggling? Surely by then Wells must have noticed that Trump’s cabinet appointments and his early calls for deregulation had already shown his intention to upend almost a half-century of environmental progress and protections. Stein’s campaign message was muddled even further by her choice of a running mate. For her 2012 presidential run she had picked Cheri Honkala, a mostly unknown welfare rights advocate who cared deeply about homelessness and income inequality but seemed to have far less to say about the environment. And if that did not make things clear enough, in one interview Baraka emphasized that the Green Party “must disrupt our relationship with the Democratic Party.” Consider the job done. It makes one wonder: Could Stein not sign up anyone with a national reputation to run with her, or did she not want to share the limelight? The only reason Johnson, Stein’s third-party competitor, ran so far ahead of her throughout 2016 is that Johnson picked precisely such a national figure as his running mate, the former head of the Justice Department’s Criminal Division and two-term Massachusetts governor, William Weld. Indeed, had it been the Weld/Johnson ticket, many observers believed the election results might have been quite different. 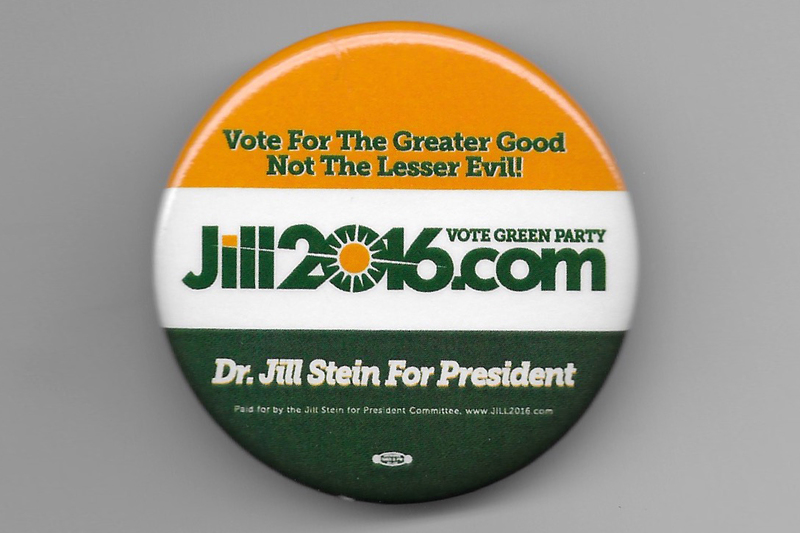 For better or worse, that was Stein’s 2016 campaign in a nutshell — her own muddled message, the Green Party’s identity crisis, and a conspicuously inappropriate choice for running mate. In spite of these handicaps, Stein managed to draw numbers that were three times better than in her previous presidential run. This is the opposite of the trend we noted in her two gubernatorial runs. Why? For openers, she raised almost three times as much money. It might be fruitful to examine more closely where that money came from. There was also Russia’s overt and covert support, and Stein’s constant Clinton bashing. Was the Clinton bashing linked to Russia’s helping hand? A recent Senate Intelligence report noted that support for Stein was “one of a roster of themes” pushed by Russia to advance its goal of putting Trump in the White House. Had Putin and Peskov seen early on that Stein might serve as a useful idiot in their quest to disrupt American democracy? At a more hidden level was a social media and bot disinformation campaign run from the Kremlin in support of Stein and against Clinton. Toward the end of the election cycle Russia’s disinformation campaign targeted African American voters in particular. One social media message presented an image of two pairs of hands. On top were white hands covered in blood, with the name Clinton superimposed; underneath, a pair of clean, dark hands with the name Stein. Reductive but effective. In the aftermath of the election there was speculation about the “Stein effect,” but in this writer’s view much of it was misdirected. People tried to parse whether Stein’s votes pulled from the R column or the D column. Particular attention focused on two states. 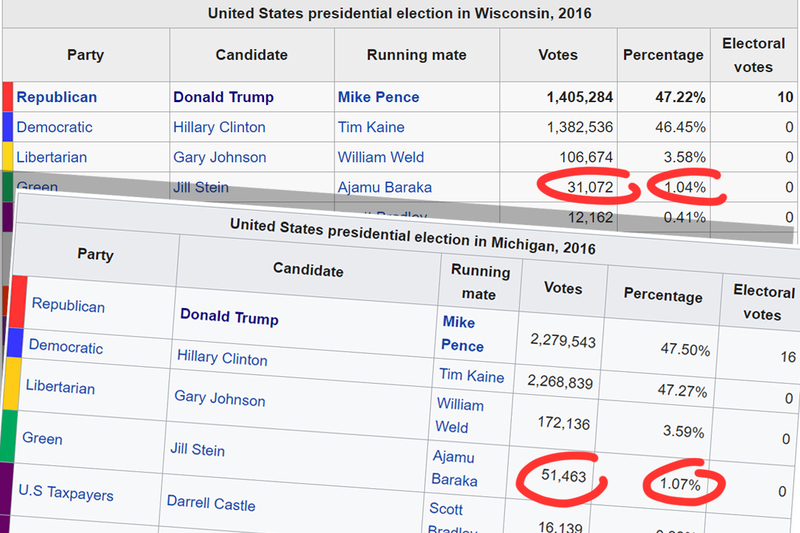 In Wisconsin, Trump edged Clinton by only 22,748 votes, while Stein drew 30,980; in Michigan Trump’s margin was 11,612, while Stein pulled 50,700 votes. But these numbers are all but impossible to parse. Nobody knows who these voters are, or how they normally vote. And in any case micro-massaging voting patterns misses the larger point altogether: how many voters across the spectrum were affected by the overall messaging — Stein’s overt declarations on the campaign trail that Clinton had the potential to do far more damage to the nation than Trump; RT’s open support on Stein’s behalf; and the subliminal bot assault through Russia’s phony social media accounts. All these messages melded as perfectly as a team of synchronized swimmers from different nations, spelling out one message: VOTE TRUMP. At the end of the day, the ultimate effect of any third-party candidate — whether intended or not — is that of the spoiler. The comedian Samantha Bee had regular meltdowns on her television show Full Frontal, wringing her hands over why Stein, a putative progressive liberal, someone to the left of Clinton — not to mention the standard bearer for the environment — was trying to get an autocratic climate denier elected president. Bee can be forgiven for coming to that very conclusion. As the 2016 campaign evolved, Stein had become an extremely effective picador for Trump, wounding and humbling the presumptive front-running candidate and heir apparent to the White House, while Trump could wave about his red cape — sorry, cap — waiting to deliver the coup de grâce. That comment seems to beg the question: Will Stein run in 2020 on the Green Party Ticket? And if she does, will she, of all candidates, meet Michael Bloomberg’s challenge head-on and finally make the environment her central issue? Related front page panorama photo credit: Adapted by WhoWhatWhy from Jill Stein (Gage Skidmore / Flickr – CC BY-SA 2.0) and Stein in Moscow (President of the Russia – CC BY 4.0).